Regardt has just completed the filming of Uitvlucht, a story about God’s unending mercy and grace. It is a story about a Love that conquers all. Uitvlucht is written by Regardt and his wife, Clara, which is due for release in August 2015. Regardt has spent the past ten years developing a project called The Lamb, which will go into pre-production in 2015 along with Tertullus, an historical drama set in first century Judea. The Medal of Honour is awarded to the director, Regardt van den Berg for Curse By (Episode 1). Against the backdrop of the contrasting faces of modern-day international cricket, the well respected South African cricket captain, Hansie Cronjé, will face his toughest test. 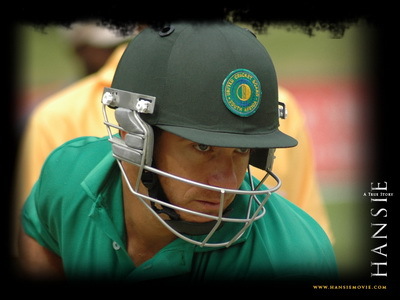 Hansie captains the South African side during their re-emergence into the world sporting arena. Under his leadership they become the world’s best team within four years, knocking Australia off top spot. Hansie’s easy smile, confident attitude and upright lifestyle make him a much loved public figure, especially in South Africa, but also throughout the cricketing world. Then the rumours start. Recordings from Hansie’s phone are released to an Indian newspaper and a distraught Hansie, after denying the rumours for a week, writes a fax that will send shockwaves around the world. What began as a flirtation with Indian bookies becomes an international furore. Hansie confesses to having taken money from the bookmakers in exchange for information on cricket matches. The result: a commission of enquiry into match fixing, with Hansie as the central figure. After a public confession where Hansie is shamed before the entire world and banned from cricket for life, he begins the long and difficult road back from despair to the place of forgiveness and restoration.